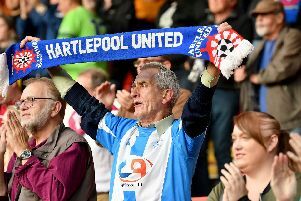 If Hartlepool United’s squad keep putting the miles and tackles in, the form will turn around. That is the Christmas message from Ronnie Moore as Pools prepare for a critical Boxing Day League Two battle with Notts County (kick-off 3pm). Pools go into the visit of the Magpies down in 21st place on the back of four straight defeats against promotion contenders. With no game on Monday, due to the Carlisle trip being postponed, Pools need a point or three on Saturday to take them into a crucial bottom-of-the-table showdown at Newport next week. Moore is desperate to strengthen his squad when the transfer window opens, but he insists that Pools can still get results by showiong the same character they did against League Two leaders Plymouth last week. “If our supporters see a player rattle an opponent then I think they appreciate that more than five or six lovely passes,” said Moore. “They want to see commitment, passion, desire, that is not an extra a football should show, that’s what a player should be giving anyway. “But if everyone does that and you get a bit of luck along the way then the breaks will come, that’s how you turn the corner. “You can’t just mope around feeling sorry for yourself. “The problem is we are not good enough to have two, three, four players off their game, it’s then you get beaten. Moore feels Pools are just one match away from transforming their season. “You are always 90 minutes away aren’t you?” he said. Moore believes a bit of blood, sweat, but not many tears, will get the backing of the Vic faithful against the talented, if inconsistent Notts County this Saturday. “If you are having a bad day with the ball, you still have your legs to run around, you still have your energy,” said the boss. “That’s what the players gave on Saturday and if they give that I think the supporters will stand by them. “They can see the lads are having a go. “We have no prima donnas, may be we have a couple who are lacking in confidence. “Probably, if we had the players fit in those positions, those a bit short of what they can do probably would not be in the side at this present time.